Celebrating the life of Orrie Catheradge Grainger, Jr.
Be the first to share your favorite memory, photo or story of Orrie. This memorial page is dedicated for family, friends and future generations to celebrate the life of their loved one. Obituary for Orrie Catheradge Grainger, Jr.
Orrie Grainger of Fayetteville, Georgia passed peacefully at the age of 92 on October 16, 2018. He is survived by his wife of 72 years, Margaret Grainger. 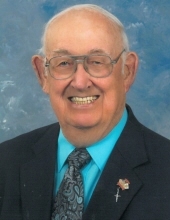 Orrie was one of seven children of Pearl and Orrie Grainger, Sr. He was the blessed father of David, Barbara, and Ronald and magnificent grandfather to six and great-grandfather to ten. Orrie was a proud WWII U. S. Navy veteran. He was a member of the Fayetteville First United Methodist Church. He retired from the Federal Aviation Agency after a long and distinguished career. He was a Mason and Shriner for many years, entertaining children as a clown at Burn and Handicapped Children’s Hospitals. Orrie loved golf, planning group trips and spending time with his family. A memorial service will be held on Friday, October 19, at 11:00 AM at the Fayetteville First United Methodist Church. Visitation with the family will be at 10:00 in the Bridal room and Fellowship/a light lunch will follow the service at 12:00 PM in the church Fellowship Hall. In lieu of flowers, memorial donations may be made to the Alzheimer’s Association or to the FFUMC. To send flowers or a remembrance gift to the family of Orrie Catheradge Grainger, Jr., please visit our Tribute Store. "Email Address" would like to share the life celebration of Orrie Catheradge Grainger, Jr.. Click on the "link" to go to share a favorite memory or leave a condolence message for the family.